When I left for Brazil nearly three weeks ago, Seattle trees were showing only a tiny hint of fall. Coming home from SeaTac Monday afternoon, the first thing I noticed was that the trees were definitely turning orange and yellow – no more hinting. I feel like I’ve been far away for a long time – both physically and mentally. Paraty was a delight – and full of surprises. When I had first started seeing images of the coastal village in southern Brazil – one I had never heard of before the announcement that the 5th Annual International Urban Sketching Symposium would be held there – I was immediately taken with its small-town charm. Unlike Barcelona’s spectacular urban vibrancy (which inspired and invigorated me even as it intimidated me), Paraty seemed more my pace. Perhaps I could leisurely walk its streets without being watchful of pickpockets! As it turned out, I had to be as watchful as ever in Paraty, though not of pickpockets. Instead of looking around for thieves, I had to look down with every step – or risk tripping on the rough stone streets and sidewalks everywhere! Or if my timing was off, I might be trapped on one side of the street or another when the high tide came in and the streets flooded with a sudden, temporary river. As small as the proverbial “one-dog town” (in fact, there were at least three, including the black one that was always asleep next to Igreja de Nossa Senhora do Rosário; if you look through the symposium Flickr group, you’ll see that the dog is a fixture in several sketches of the church), I could walk from end to end in a short time (though it always took me longer than I expected because I was trying not to trip). Despite its initial impression of being a sleepy town, Paraty is anything but quiet. I woke every morning to a cacophony of exotic birdsong and church bells. One day at 6 a.m., we were awakened by fireworks honoring a patron saint. Music was often playing, and the voices of local business owners and patrons filled the streets. 8/27/14 Our hardworking symposium staff at the opening reception. Barcelona last year is the only other symposium I attended and can compare Paraty to, so I don’t have a broad range of reference, but to me Paraty was an ideal symposium location in several ways. Its small size made it easy to run (I mean walk – no running on those stony streets!) 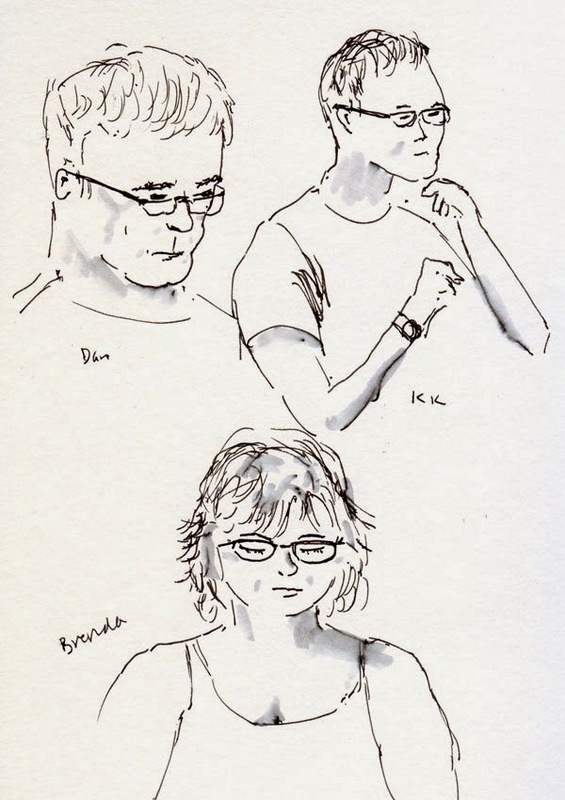 between the various symposium events, and it was so much fun to see other sketchers everywhere, anytime. The scale of the architecture was less imposing (can you say Sagrada Familia? ), and I enjoyed the smaller workshops and activities more. 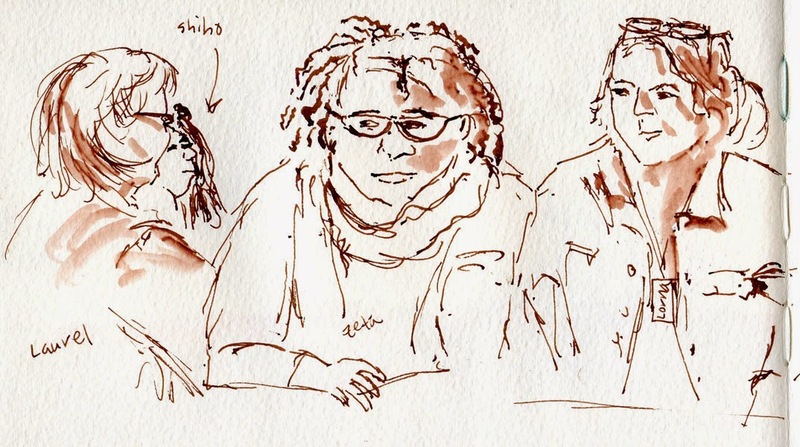 In Barcelona, the culture was to dine late in the evening, so I missed most of the informal drink-and-draws because I was usually in bed by the time they took place. In Paraty, I could attend group dinners without losing beauty sleep. Stone streets notwithstanding, Paraty was more my pace. The symposium structure itself keeps maturing and improving. This year I could choose to attend a mix of workshops and activities, giving me a broader range of experiences. 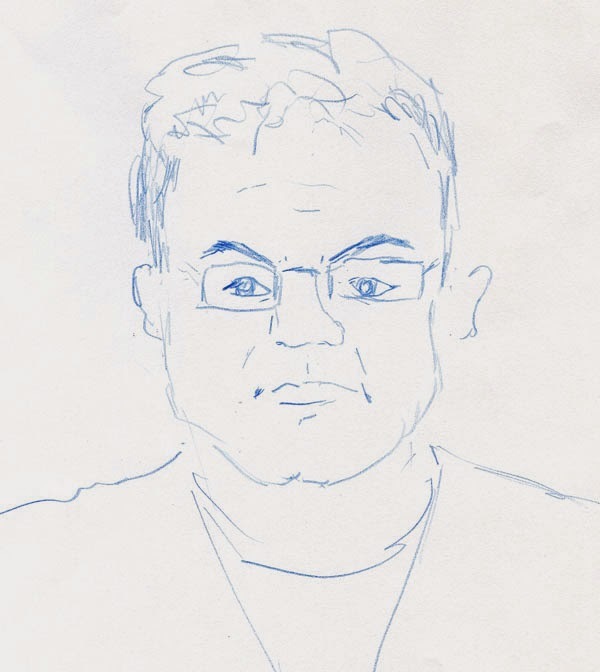 For example, by opting to forego the Thursday afternoon workshop and attend a portrait exchange instead, I met a number of people who had not registered for the workshop pass, so I probably wouldn’t have had an opportunity to talk to them otherwise. 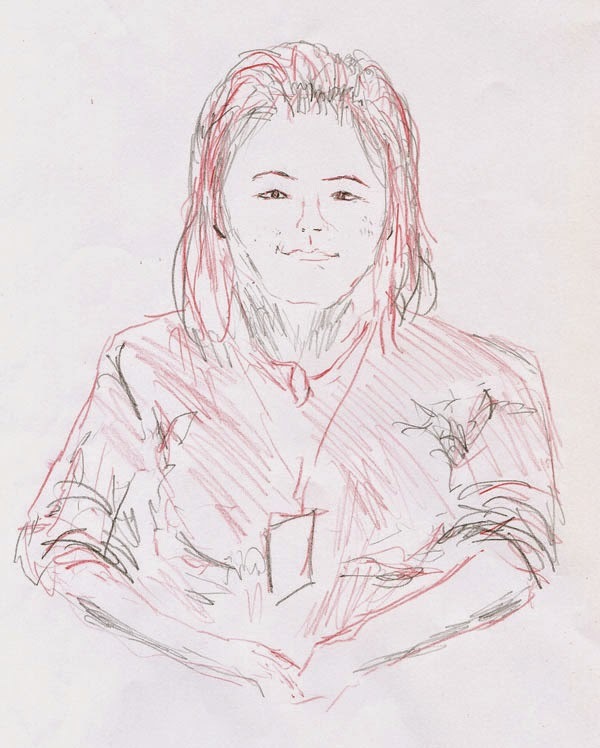 Even better, I spent time with each one sketching their portrait. 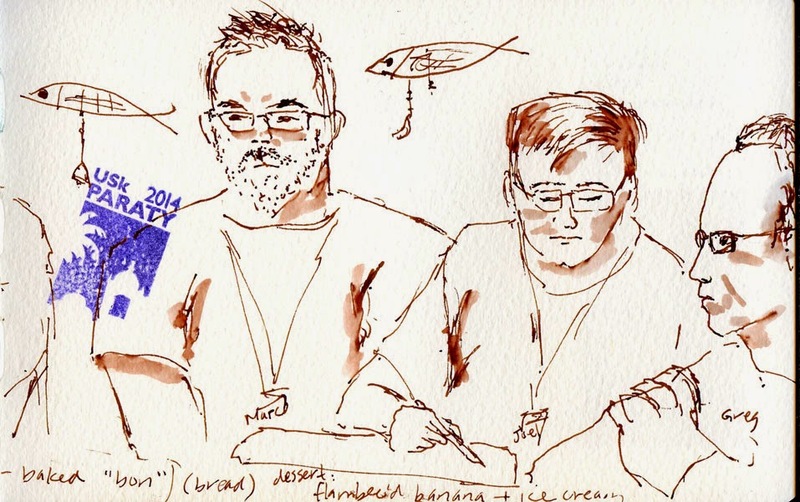 Which brings me to the same conclusion I came to at the end of the Barcelona symposium last year: Regardless of the location or specific workshops (which were enormously useful), what I value and remember most about the Urban Sketching Symposium are the people I met or became reunited with there. I heard a number of attendees use the term “family reunion” to describe the atmosphere, and it’s exactly appropriate. 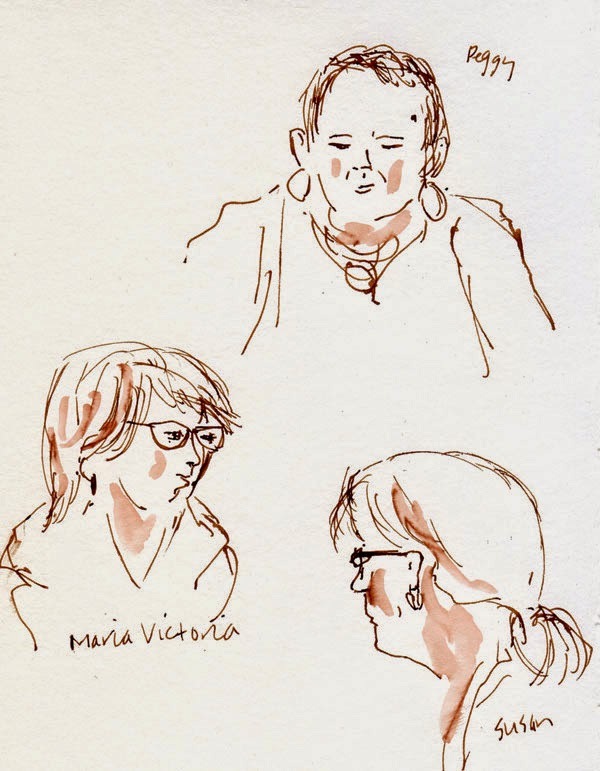 I cherish the time I spent, both at the symposium and later in Rio, with people whose sketches I keep up with online all year round or just met and look forward to seeing again at a future symposium. 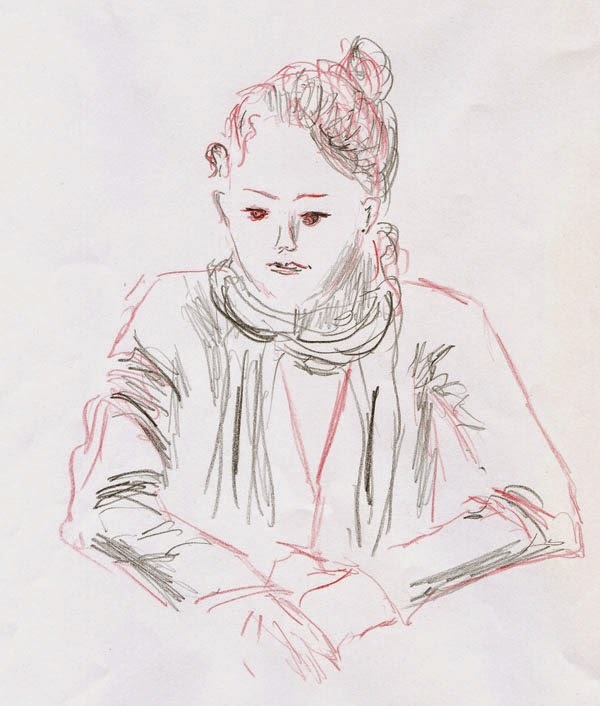 Time and time again, I was moved by the communication that can transpire even without much of a common spoken language when we all share the common language of our love for sketching. I could post here some of the many sketches of buildings and streets I made in Paraty (you can see them in the symposium Flickr group). 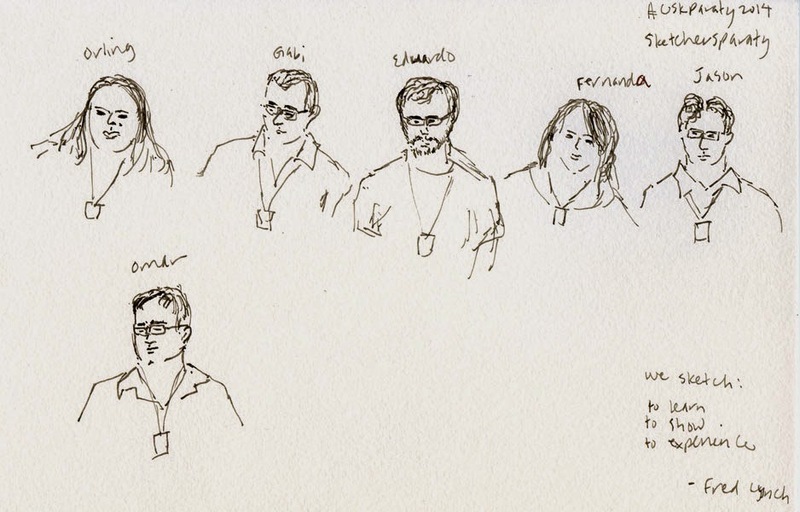 But in honor of the many people who made the symposium special to me, instead I’m posting some of the sketches I made during the portrait exchange, informal drink-and-draws and the final symposium sketchwalk. Thank you, everyone, for a very special time in Paraty. I feel privileged to be part of this vast global network. This was fun to read, Tina! I'm glad it was so much fun. I loved reading this blog Tina, what wonderful information you have shared, almost felt like I had been there. Your sketches are getting better and better, you are quite an inspiration. Thank you for sharing. What a great write up about the symposium. Really interesting to read your comparison of large city/ small city locations. Thanks so much, Tina! Thank you, all, for your comments! Brazil was fabulous, but I'm also happy to be sketching at home again!